At GTC Silicon Valley in San Jose, NVIDIA released the latest version of TensorRT 5.1 which includes 20+ new operators and layers, integration with Tensorflow 2.0, ONNX Runtime, and TensorRT Inference Server 1.0. In addition, TensorRT 5.1 includes new samples, new debugging capabilities through support for the NVTX format and bug fixes. NVIDIA Developer Program members can get access to TensorRT 5.1 Release Candidate here. TensorFlow 2.0 was released at Tensorflow Dev Summit in March 2019 with many new exciting features including new and simpler APIs that enable developers to go from data ingestion, transformation, model building, training, and saving, to deployment much more easily. TensorFlow 2.0 is tightly integrated with and includes NVIDIA TensorRT offering high-performance optimizations with the newly introduced APIs. Developers can continue to get the powerful optimizations of TensorRT with minimal changes to their workflow. Learn more about how to get started with TensorFlow 2.0 here. Since its release last year, the TensorFlow-TensorRT integration has been expanded to support a wide set of new networks for image classification, object detection and neural collaborative filtering. Find a complete list of supported operations here: [LINK]. Microsoft released an open source preview of NVIDIA TensorRT integration with ONNX Runtime. With this release, Microsoft offers another step towards open and interoperable AI by enabling developers to easily leverage industry-leading GPU acceleration regardless of their choice of framework. Developers can now tap into the power of TensorRT through ONNX Runtime to accelerate inferencing of ONNX models, which can be exported or converted from any popular framework. All future versions will be backward compatible with this version. 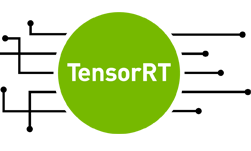 Download the TensorRT inference server from the NVIDIA GPU Cloud container registry or from GitHub.